Is Jesus the Father, the Son, and the Holy Spirit? 'Oneness' Pentecostalism got underway in 1913 when somebody at a camp-meeting received the 'revelation' that "the [singular!] name of the Father, and of the Son, and of the Holy Ghost" of Matthew 28:19 is 'Jesus'. This revelation has left Bible-readers asking ever since, 'Who's on first?' If Jesus is the Father, Son and Holy Spirit, then who was praying to whom at the Garden of Gethsemane? "Do these titles as used in Matthew 28:19 mean that there are three separate and distinct persons in the Godhead? No, they refer to three offices, roles, or relationship to humanity." (UPCI, '60 Questions on the Godhead'). Let's examine Plan A. Did the apostles preach Jesus as the Father, or as the Son? Who is Jesus: the Father or the Son? Know and See What did the Apostles preach? So how to explain the 'I-thou' relation of love presented in the gospels between 'the Father' and 'the Son'? Has one 'title', 'office', 'role' or 'manifestation' ever loved another? Plan A just crashed and burned. "Remember this: Jesus is unique (through the Incarnation). He is both God (The Father) and Man (the Son)...The flesh is the Son and The Spirit is God." (William B. Chalfant, ThD, 'Is The Godhead One Or Three?'). Does 'the Son' mean 'the flesh' of Jesus of Nazareth? The Son = The Flesh? "The death of Jesus is a particularly good example. His divine Spirit did not die, but His human body did. We cannot say that God died, so we cannot say 'God the Son' died. On the other hand, we can say that the Son of God died because Son refers to humanity." (David Bernard, Oneness of God, p. 99-100). His Love Is Death Extinction? "The Sonship began at Bethlehem. The Incarnation was the time when the Sonship began. The angel, in Luke 1:35, said to the virgin mother-to-be, 'That holy thing which shall be born of thee shall be called the Son of God.' Here it is clearly revealed that the humanity of the Lord Jesus is the Son. 'That holy thing' — that physical, fleshly one — is the Son." (Chapter 3, Gordon Magee, Is Jesus in the Godhead or Is the Godhead in Jesus?). But who is the Son, in the Bible? Did He create the worlds...or did He not exist except as a 'plan' or 'concept' until a babe was born to Mary? 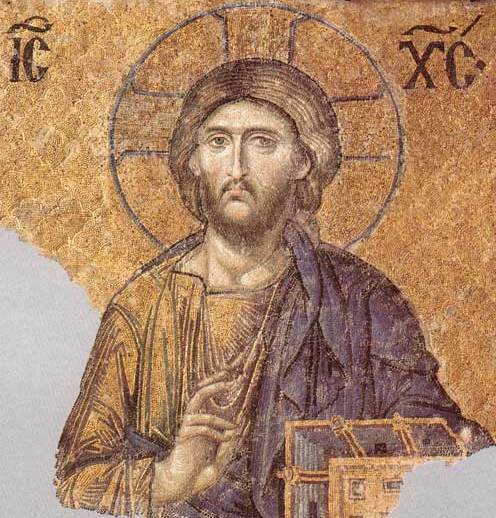 The Son of God: Eternal God or beginning in time? The Son: Eternal God or Beginning in Time? The Ending of the Sonship? "Then Jesus came with them to a place called Gethsemane, and said to the disciples, 'Sit here while I go and pray over there.'" (Matthew 26:36). "He went a little farther and fell on His face, and prayed, saying, 'O My Father, if it is possible, let this cup pass from Me..." (Matthew 26:39). In 'Oneness' Pentecostalism, 'Jesus' is the name, not only of 'the Father' and of 'the Son,' but also of the Holy Spirit. Is this Biblical? Is Jesus the Holy Spirit? Of Himself Who is Jesus' father? That God is 'Three-in-One' is no mystery; take a scripture like 1 Peter 1:2: "Peter, an apostle of Jesus Christ, To the pilgrims of the Dispersion in Pontus, Galatia, Cappadocia, Asia, and Bithynia, elect according to the foreknowledge of God the Father, in sanctification of the Spirit, for obedience and sprinkling of the blood of Jesus Christ: Grace to you and peace be multiplied." (1 Peter 1:2). Count on the fingers of one hand the names invoked...pardon me, 'titles'...and on the other hand, the number of true and living Gods in the universe: "For You are great, and do wondrous things; You alone are God." (Psalm 86:10). Three fingers showing on one hand, one on the other...Three-in-One! The doctrine of the Trinity is grossly misunderstood by 'Oneness' Pentecostals, who describe the Trinity as "three gods." What is the doctrine? d.) The Holy Spirit is God. — and their answers are all over the map. Some frankly admit they do not believe 'the Son' is God, on the strength of the man-made definition at the heart of their system, that 'the Son' means 'the flesh' of Jesus of Nazareth. Others claim to believe it, but then equivocate on the meaning of 'the Son' when asked how it is that the Father loves the Son and the Son loves the Father. 'Oneness'-speak confuses Bible-readers, who are accustomed to hear 'the Son' as synonymous with 'Jesus:' "And this is His commandment: that we should believe on the name of His Son Jesus Christ..." (1 John 3:23). In 'Oneness'-speak, the two terms are not coterminous. 'Oneness' Pentecostals treat 'Jesus' as a name of 'the Father' also: "Jesus (meaning Jehovah-Savior) is the revealed name of God in the New Testament. Jesus is the name of the Father, Son, and Holy Ghost." (David Bernard). Sharing the 'Father-onlyism' of the Unitarian Universalists, only on the strength of this identification do they confess Jesus' Deity at all. Like the Unitarian Universalists, the 'Oneness' Pentecostals confess that 'the Father' is God; unique to themselves, they express this by saying 'Jesus is God'. Like the Unitarian Universalists, they believe 'the Son' to be a man who came into existence at Bethlehem, indwelt by 'the Father' who alone is God. It's only on the strength of the 'Philadelphia-lawyer' trick of defining 'Jesus' as a name of 'the Father' that 'Oneness' Pentecostals can slip their nose into the Christian tent, and claim to believe that Jesus is God! Defining 'the Son' to mean the 'flesh' creates obvious difficulties in unequivocally proclaiming 'the Son' to be God, rather than a human 'tabernacle' or 'shell' in which God dwelt. "I have seen God face to face"
The church sings, "Holy, Holy, Holy, Lord God Almighty; God in three Persons, blessed Trinity!" Is this language Biblical? Is 'Person' a Biblical Word? Thrice Holy Who are the 'God-people'? Is the Trinity of Pagan Origin? Although claiming to base their teachings on the Bible, 'Oneness' Pentecostals often resort to extra-Biblical historical arguments whose content cannot be substantiated from the Bible, some of them fanciful: "The actual origin of the Trinity Doctrine predates Christianity. The ancient Babylonians and other Pagan nations all worshiped the Trinity." (Biblical Apostolic Organization web-site). Is that so? There's One Throne in Heaven and Jesus is Sitting on It! Those familiar with 'Oneness' Pentecostals have heard this slogan. What does it mean? Is it Biblical? What will we see when we come before the throne? "Obviously the Son did not actually exist before Bethlehem, else we should have no difficulty locating Him as being actually present in the Old Testament and the period it covered." (Chapter 4, Gordon Magee, Is Jesus in the Godhead or Is the Godhead in Jesus?). Where was 'the Son' in the Old Testament? He's in there! "Who has ascended into heaven, or descended? Who has gathered the wind in His fists? Who has bound the waters in a garment? Who has established all the ends of the earth? What is His name, and what is His Son's name, if you know?" (Proverbs 30:4). "'Look!' he answered, 'I see four men loose, walking in the midst of the fire; and they are not hurt, and the form of the fourth is like the Son of God.'" (Daniel 3:25). "It is entirely in accordance with the promise, 'I will be with thee' (Isa. 43:2), and the consistent teaching of Scripture touching the theophanies to recognize in the One who appeared in the fire the very Son of God, the Deliverer of His people. The circumstances of His appearance with Shadrach, Meshach, and Abed-nego, illustrate delightfully the lesson of Romans 8:37. 'In all these things we are more than conquerors, through him that loved us.' Had the three been miraculously preserved in the furnace, yet without any sign of the divine presence, they would certaily have been conquerors. But the surpassing wonder of their experience was not their deliverance, viewed in itself, but rather the companionship of their Lord in the furnace. In the added marvel of this sacred fellowship they were 'more than conquerors.' So was it in Paul's day. So has it been with all who have known amidst their trials the joy of walking with the Son of God." (H. C. Hewlett, The Companion of the Way, pp. 110-111). 'Oneness' Pentecostals present an argument in this format: The Bible cannot teach the doctrine of the Trinity because its authors were Jews and Jews do not believe in the doctrine of the Trinity. The Jehovah's Witnesses are fond of this argument as well, hoping thereby to eliminate any distinctive doctrines of Christianity. But what did a first century Jew like Philo Judaeus believe about God? He believed, as the Bible teaches, that the One True and Living God is the Father, His Word, and His Holy Spirit. Reading his words can serve as a useful corrective to projecting modern Rabbinic theology back into a period before it ever came into being. Philo's first century Jewish theology is closer to Christianity than to some of its critics. "I have also heard of one of the companions of Moses having uttered such a speech as this: “Behold, a man whose name is the East!” [Zechariah vi. 12]. A very novel appellation indeed, if you consider it as spoken of a man who is compounded of body and soul; but if you look upon it as applied to that incorporeal being who in no respect differs from the divine image, you will then agree that the name of the east has been given to him with great felicity. For the Father of the universe has caused him to spring up as the eldest son, whom, in another passage, he calls the firstborn; and he who is thus born, imitating the ways of his father, has formed such and such species, looking to his archetypal patterns." (Philo Judaeus, On the Confusion of Tongues, Chapter XIV). Philo is of course not a Christian, nor are his writings in any sense authoritative for Christians. He is however a helpful corrective to the anachronistic projection of later, anti-Christian rabbinic theology into the first century. The number of titles for the Logos shared between Philo and the New Testament is really quite remarkable: Good Shepherd, High Priest, etc. The only resort Unitarian Universalists and 'Oneness' Pentecostals have for explaining these titles is the incarnation. But Philo did not believe in any incarnation. So you are left having to explain the same titles with two entirely different explanations. The explanation 'Greek philosophy' is of course preposterous on its face; but there's already a problem if there must needs be two completely different explanations for the same thing. The best explanation is parsimonious: it posits no unnecessary entities, as William of Ockham phrased it. Both Paul and Philo's account, by the way, would be the same: the Old Testament already teaches these doctrines, and so they are shared by virtue of their origin at the same fount. A theory which requires two completely different explanations for the same phenomenon goes beyond uneconomical; it is prodigal and extravagant. It is possible of course to model the world by ad hoc explanations which do not mesh nor add up to a coherent world view, but that is not recommended; it is not the way to run a railroad. "After 4,000 years of God relating with mankind and revealing himself as one Jehovah, one Yahweh, talking with Moses face to face, giving promises to Abraham, speaking through the prophets, is He now going to appear as a God no one has ever known before, or has ever heard of before? Do you hear about God the Son in the Old Testament? "No, you don't hear about God the Son in the Old Testament. And the only references that you find to the Son of God in the Old Testament are prophetic references to the time that the Son would come and we just read about when He came, and it was the God of the Old Testament that has now come and revealed Himself in the form of man. Isaiah chapter 25 and verse 9 tells us, and it shall be said in that day, Lo, this is our God. Who is that talking? "That's the Jews that are talking. How many gods do Jews believe in? How many gods did the Israelites have? How many gods did Moses know? How many gods did Abraham know? "None of them knew anything about a God the Son. They didn't know anything about a God the Holy Ghost." (Nathan Dudley, at 51:21-52:39,	Edward Dalcour vs. Nathan Dudley, November 11, 2016 Debate, 'Is the God of Scripture Triune?'). How can Christians simultaneously assert that Father and Son are equal, yet also accept scriptures like John 14:28? The key is scriptural: Philippians 2:5-11. "...that all should honor the Son just as they honor the Father." (John 5:23). "Kiss the Son, lest He be angry, and you perish in the way, when His wrath is kindled but a little. Blessed are all those who put their trust in Him." (Psalm 2:12). "And Elisha sent a messenger to him, saying, 'Go and wash in the Jordan seven times, and your flesh shall be restored to you, and you shall be clean.' But Naaman became furious, and went away and said, 'Indeed, I said to myself, "He will surely come out to me, and stand and call on the name of the LORD his God, and wave his hand over the place, and heal the leprosy."'" (2 Kings 5:10-11). Usually the minister at Christian baptism recites from Matthew 28:19: "Go therefore and make disciples of all the nations, baptizing them in the name of the Father and of the Son and of the Holy Spirit..." Though it's tough to see how reciting scripture can send a soul to Hell, according to the 'Oneness' Pentecostals, those so baptized are eternally lost. Their exclusive claim to salvation rests upon their boast of possessing the only baptismal formula that 'works'...and it's not Matthew 28:19! How did the Apostles baptize? According to the 'Oneness' Pentecostals, the [singular!] "name" of Matthew 28:19 serves as a marker for a proper name to be supplied later. Alas, this transformation works only once, and in only one direction. Is that actually how this common idiom functions? What does 'in the name' mean? Interpolation Is the Bible Trustworthy? Is Salvation by Faith or by Works? Tower of Babel Merited Favor? What is Faith? What are Works? Everyone What must I Do? What have you Got? Savior Will? Is Baptism the 'New Birth' of John 3:5? Is Acts 2:38 a "Salvation Plan"? See Malta and Die What is the Question? John the Baptist Savior Peter? Is speaking in tongues essential for salvation? Will the real 'Oneness' Pentecostals please stand up? "No organization has murdered (as 'heretics') so many real Apostolic Christians as the Roman Catholic Church! History knows no other possible organization than the RCC to fit verse Rev 17:6." (Steve Winter, PRIME.org). But is it for real? Were rivers of blood shed by 'Oneness' Pentecostal martyrs down through the ages? For that matter, were there any 'Oneness' Pentecostals prior to 1913?